What can we learn from dogs? A lot, but it takes careful listening. Abigail Thomas is learning to live — and her dogs are teaching her how. Rather, they are teaching her how to begin again after losing her husband. He isn’t dead but has suffered a brain injury so severe that he has, essentially, disappeared. The person Thomas married is gone. Her “new” husband must spend the rest of his life in an institution. He slips in and out of rages, terrors and hallucinations. The author, though still married, is alone now, traveling in a foreign land, stumbling through unmarked territory. Her dogs show her the way. The author keeps a small notepad with her when she visits her husband or when he comes home to spend an afternoon. Sometimes she scribbles furiously when he speaks, startled by moments of lucidity or by oddly relevant utterances that sometimes emerge from his jumbled thoughts as if he were a momentary sage. “I feel like a tent that wants to be a kite, tugging at my stakes,” he announces one day. And Thomas writes it down. Always she is looking and listening, hoping for proof that the Rich she once knew, or some version of him, is still there. For Thomas, it seems, the act of writing itself has become an act of redemption. From the depths of catastrophe, she has crafted a painfully honest and loving portrait of the irrevocably altered life she finds herself leading. The stories are few, the moments are spare, but what Thomas tells us is shot through with light. Mary A. Fischer’s Stealing Love, by contrast, is full — almost too full — of examples of the potentially damaging effects inherent in language. Her childhood was scarred by hurtful words and a heartbreaking lack of deeply felt, unspoken love. “We subsisted on emotional crumbs,” she writes, “because there was nothing else.” As she becomes an adult, the effects of her childhood and the underlying issues remain the same: She tells of her unsatisfying relationships with her family members and her peers, especially men. Only the dogs (and several other animals) in her life provide a source of solace. Fischer’s memoir revolves around the tragic institutionalization of her mother in an asylum for the mentally ill. Today, Fischer suggests, her diagnosis would likely have been depression. But in the 1950s, people living on the edge were often given “treatment” that tipped them into the abyss, instead of pulling them back to the more normal life they might have lived with the right kind of assistance. Earnest and solidly written, Fischer’s account of her life often resembles a diary, one that includes countless detailed entries most helpful perhaps to the writer herself. As a motherless child whose emotionally absent father sends her to a strict and cheerless boarding school, Fischer develops an acute empathy for the plight of those who are suffering. Years later, as she rescues dogs from abusive homes — actually donning dark clothes and a hat for a nighttime foray into a neighbor’s yard, for example — the parallels with her own life are obvious. 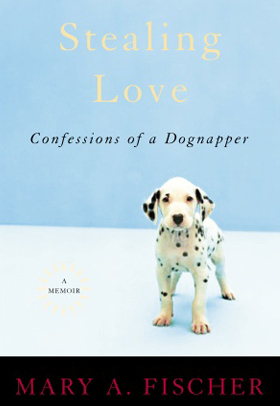 The book’s subtitle, however — Confessions of a Dognapper — is oddly misleading. Readers hoping for some rollicking tales of adventure will be disappointed. The handful of dognapping incidents are essentially used as a device to frame the book — described briefly in the beginning and then in more detail in the closing chapters. In the end, despite different approaches, Thomas and Fischer highlight the same simple fact — dogs don’t talk — and then follow it to a profound truth. A great many people, it seems, could take a few life lessons from the dogs celebrated on these pages. Less talk, more quiet companionship; less critical commentary, more unconditional love — the list of “Dog Lessons for a Happy Life” goes on. Sure, our canine companions have their share of scuffles. They bark and fight. They have their droopy days. But they get over it. Before long they’re back — bouncing and wagging, ready for love.